The Most Fabulous Bargain in Magic! The listening experience of a lifetime! 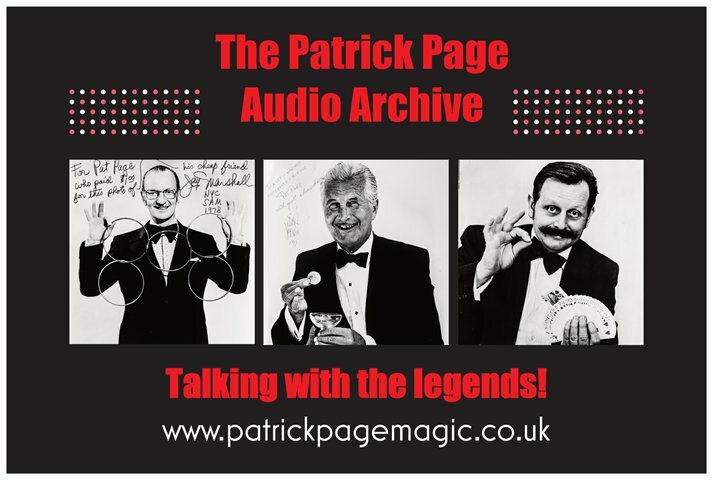 The Patrick Page Archive is a previously unheard and unavailable collection of recordings of magic greats, which gives a valuable and unique insight into the world of magic by the giants of the day. All of it has a Patrick Page connection of some kind, Patrick was not only a great performer but also a born interviewer. He had the foresight to interview many in magic, and ask them the sort of questions most would not have either the knowledge to ask or even dare to ask. Patrick’s technique, like all good interviewers, was to ask questions he probably knew the answers to, enabling him sufficient license to get the right and important answers he knew would interest listeners. Sadly, Patrick and many of his friends are no longer with us. The Patrick Page Archive is his legacy to the world of magic, allowing us the opportunity, for example, to hear Dai Vernon talking about his encounters with Houdini, or to hear Cy Endfield talking about the magic he brought to the UK from the USA when forced to leave to avoid the rise of McCarthyism. Endfield was far more than the Director of the great film classic Zulu, he’d had a keen interest in magic from his childhood days. Listen to Wally Davenport talk about working with his father Lewis Davenport and how the name Lewis Davenport came about, and then read John Davenport’s insight into that story. Hear Fred Kaps learning that the Easy Money effect that he had made his own, had been invented by Patrick Page. There are so many interesting stories and revelations about magic in over 50 hours of material. Patricks astute questioning provides you with a unique and revelatory listening (and learning) experience. One particularly fascinating interview is with Albert Goshman. They both reflected on how they would be remembered when they were gone. Both had families who were not interested in magic per se, so assumed the families would not continue the tradition. Albert was convinced that since he had not written a book, no-one would remember him. Well, how wrong they both were. The son of Albert Goshman runs a hugely successful factory making sponge balls for magic effects, and the Page family now run Patrick Page Magic. As a result of this interview Patrick agreed to write Magic by Gosh, the definitive book about Albert Goshman. And only Patrick Page could have asked Albert Goshman about the way he dressed…. ‘It’s a fantastic effort and, apart from being entertaining, it really will be a most useful resource. The scope of the material is breath taking’. ‘Plug in the earphones, sit back and relax in the company of some of magic’s most famous performers. It’s a star studded cast that includes Fred Kaps, Ken Brooke, Charlie Miller, Maurice Fogel, Dai Vernon, Cy Endfield and many many more. This is the history of magic told by the people who made it‘. The archive combines dedicated interviews, performances and lectures as presented at the time. in addition, we also feature the famous “Ramsay Reunion” in it’s entirety, both edited and uncut, which includes performances and lectures by Ron Wilson, Gaetan Bloom, Philip Fialho, Roy Johnson, Doug Alker, Kevin Fox, Geoff Ray, Trevor Lewis, Piet Forton, Bob Read, Fred Kaps, Dai Vernon, David Roth, Juan Tamariz, all introduced by Patrick Page. A further feature is the inclusion of “The Lipman Interviews”, featuring Terry Herbert, John Henley, Alan Alan, Walt Lees, George Kovari, Jay Marshall, Hector Robinson (son of Chung Ling Soo), Peter Newcombe, Ali Bongo, Peter Warlock, Eric Mason, David Berglas and Bobby Bernard. History live! The opportunity to listen to so many magic luminaries of the 1970s, almost all sadly deceased, talking about their careers, their magic and general views on the contemporary scene, is now a dream fulfilled with the advent of the Pat Page Audio Archive. It is an invaluable repository of magic history recorded by the performers who made it and affords many hours of interesting and enjoyable listening. With approximately 40 hours of digitally restored recordings, sound improved where possible, and accessible for your complete convenience in the easiest way imaginable, the entire cost of this unique package comes in at less than the price of a cup of coffee for each hour of recorded time! For your further enjoyment we have added, where possible, videos – enabling you to see many of the listed Artists, particularly helpful when exploring the Lectures, so although an audio archive it has the added dimension of visual performance. 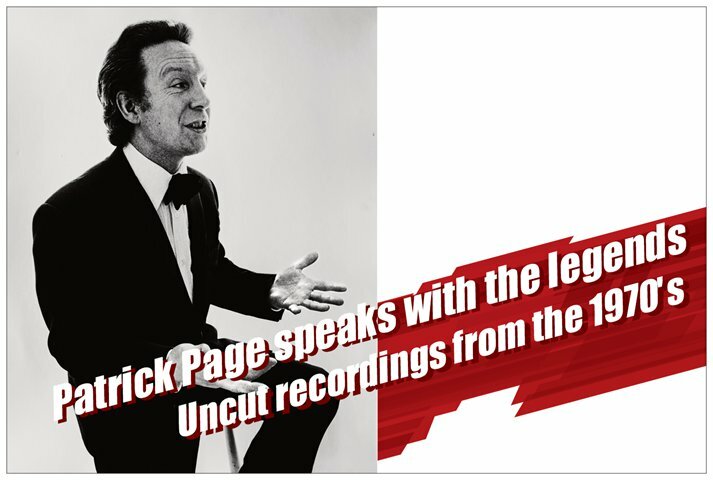 The Patrick Page Audio Archive is a historical living record of many great magicians that captures for all time their real voices, their wisdom in their own words, exactly as they spoke in that moment. And that is the essential value of this Archive – it’s rich with wit, humour, magic effects, tips, wrinkles, prime knowledge and choice gossip, you will be educated and royally informed in equal measure. There is a lot of it to enjoy, and the beauty of the aural medium is that it concentrates your listening experience wonderfully; it’s the least distracting of modern means of communication. Given that Patrick Page was nothing if not the most generous of men; we think he would be so very happy knowing that you can enjoy a truly magical experience. I’ve immediately purchased the series of interviews and now listen to one after the other on my travels. Barry Murray and Gordon Drayson have done a remarkable job on remastering these wonderful tapes, which are a piece of cultural history of magic. Moreover, the interviews harbor lots of biographical information, anecdotes and quite a bit of very practical information that are of equal interest to the beginner and the expert. They have my highest recommendation! We have set an initial sales price of £50 for the “entire package” – this is an early bird introductory price, the price will increase in a while. Buy it and get it NOW – Once you have clicked on the buy button and completed your purchase, you have immediate access to the entire Archival content. For a one time purchase price, you will have a lifetime of enjoyment. As well as being of major historical importance for the magic world, The Pat Page archive holds profound lessons for today’s performers. The interviews are inspiring, educational and moving. Hearing Pat talk to some of the all time greats of magic made me laugh out loud and, on more than one occasion, cry. I can’t recommend the recordings highly enough and genuinely believe I’ll be better at my job after listening to them. Thank you. Since I knew most of the subjects interviewed personally, this was a rare opportunity to sit in on one last conversation. Like Jay Marshall used to say about his act, the interviews are educational as well as entertaining. Making these tapes available to one and all is a gift to the magic world. Many thanks.